Do up Thanksgiving or Christmas dinner in the state's sparkliest, goldest, flower-laden-iest dining room. Do up Thanksgiving, Christmas Eve, or Christmas dinner in the state's sparkliest, gold-est, flower-laden-iest dining room. ALEX MADONNA'S GOLD RUSH STEAK HOUSE... we unsubtly hint at here, a visual symphony of pink and red and gold and lights and flowers and more flowers and a doll on a swing. Even if you're in there on an April afternoon, the room, with its lines of undulating booths and bright vibe, still rocks a yuletide feel. So it is good to know that you can book Thanksgiving and/or Christmas dinner in that place, and skip the whole decorating thing back at home (if you long to take a year off). SO WHAT'S ON THE 2016 MENU? The yum-yum rosters are up for the November and December occasions (as well as a separate one for Christmas Eve) and include Roast Turkey, Baked Honey Cured Ham, Roast Duck, and a bevy of other hearty mains, from Grilled Portabella to Pink Shrimp Dolce Vita (a hue-perfect entree for the setting). A number of pies, including pumpkin, are among the choices, and the famous Pink Champagne Cake may be ordered, too. And, worry not: The pink chocolate is back. 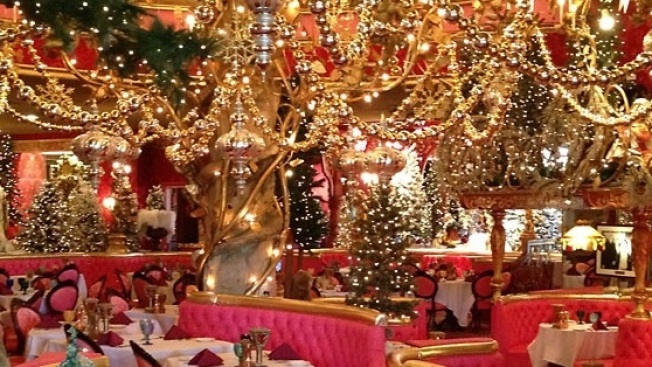 If you're searching out an over-the-top setting for a holiday supper, look to the San Luis Obispo landmark, the one with the themed rooms and the famous steakery that's all pink, gold, mirrors, and, yes, the occasional doll.